Our black bear hunts and moose hunts take place in the remote regions of northern Alberta Canada along the Peace River. Our hunts are conducted in one of the best areas in Alberta. From rivers to hills and through the boreal forest, our large population of black bear and moose grow to trophy size. 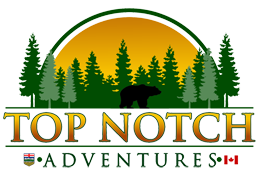 Top Notch Adventures is a family operation since 2005, owned and operated by Frank and Kathy Martens. We were born and raised where we hunt and know our hunting area well. Our main goal is making all hunters feel comfortable and happy, doing what ever it takes to have an exceptional hunting experience. If you are up for a “Top Notch Adventure”, we offer an Alberta wilderness hunting experience you won’t want to miss! BOOK A MOOSE AND BLACK BEAR HUNT WITH US! Our professional guides are avid hunters and and will work hard to get you the big old bruin black bear you been searching for or calling in that Canada moose you’ve been dreaming about.